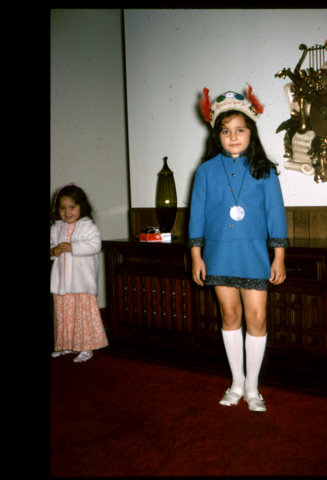 This is my "Caravan" uniform - our church (Nazarene) had a kids' program on Wednesday nights and we earned badges and rewards and feathers(?) as part of the reward system for memorizing scripture, bringing friends, etc. I'm probably in 7th grade in this picture. 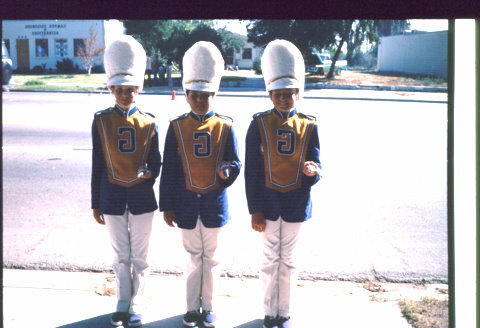 My friends and I are probably getting ready to march in the Escondido Christmas parade. My mom scanned this pic in - it used to be a slide (remember those?). That's why the G (for Grant Middle School) is backwards. Silver trees were all the rage in the '60's. Ours had beautiful shiny blue ornaments all over it. After Christmas, the whole thing went back in a box and we couldn't wait to see it again the next Christmas! 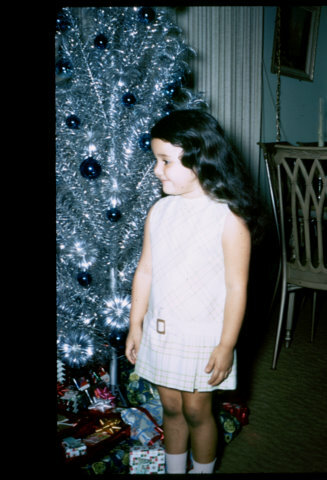 I'm pretty young here - maybe 4?